As we continue on with our series, I’m bringing to you some blogs that you might want to take a look at. I am both proud and honored to be affiliated with both the great writers of Chip & Company, and the incredible group that is known as the Magical Blogorail, and in this small way, I hope to be able to say thanks to those bloggers that have helped to make me the blogger that I am. Next on our list is my friend Chad’s site, Days in the Park! My friend Chad is a member of the Magical Blogorail Blue line, he is an original member of the group! Chad is a Disneyland fanatic, and lives close enough to the “Park”, as he calls it, that he and his family and friends are able to go to Disneyland fairly frequently. What makes Chad’s site stand out in my mind is the enthusiasm that he brings to every post he writes. I had been following Days in the Park for a while, I found out about them around the same time that I met Beth from Pursuing the Magic. Another thing that sets Chad’s blog apart in my mind is his creative writing style and his western theme! In addition to regular blog posts, Chad also brings in video and photos into his posts, his ‘Magical Mystery Mondays’ series is a big favorite of mine, although seeing as how I’ve never been to Disneyland before, I rarely get them right! In addition to his blog, Chad has also added podcasting to the resume! With his friend Mark, they have been producing a show approximately every month. Check them out if you are interested! Chad is a really good blogger, and is someone that I consider a friend. If you want to see the other side of Disney, check out Days in the Park! Blogs to Check Out – Magical Mouse Schoolhouse! helped to make me the blogger that I am. Next on our list is my friend Jodi’s site, Magical Mouse Schoolhouse! Jodi is a proud member of the Magical Blogorail Yellow line, and is also one of the great writers for Chip and Company! Jodi homeschools her children, and has learned that the best way to keep students interested is to provide interesting learning material! Additionally, Jodi has turned her love of Walt Disney World into a unique learning opportunity for her children — by showing that you can “Expand your Homeschool with Disney!” In all things, Jodi has tried to show her children — and her readers — that there is something to be learned out of every experience. For example, a trip on Splash Mountain might be a learning experience to talk about how gravity affects us, as well as how fast objects drop depending on factors such as weight, friction, etc. At the end of each of blog posts, Jodi provides a section called “Today’s Takeaway”, in which she challenges the reader to help get their own children involved in learning something about today’s topic. In addition to all that, Jodi also has a large assortment of links to various homeschooling sites, so if you homeschool, or are thinking about doing so, you might want to take a look at all that is available on her site! One other thing that Jodi does is host the “Tiggerific Tuesday! Blog Hop…or Bounce!” This weekly occurrence is her blog hop, and it gathers a ton of links for you to enjoy! If you are interested, feel free to take a look at it by clicking the button below! Jodi’s site is a great Disney resource, but even more importantly, she incorporates teaching into it — teaching that is both educational and fun! If you haven’t been to her site before, I urge you to take a look at it! Welcome to another day in our countdown to Disney! 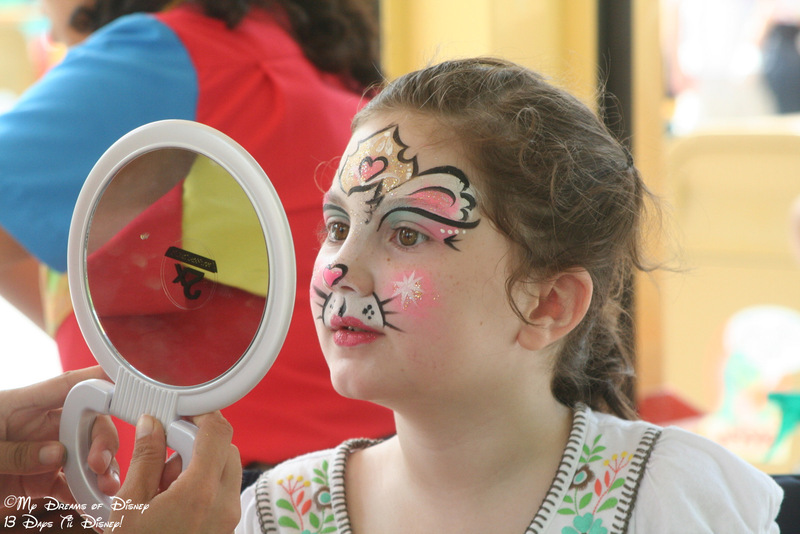 Today’s picture takes us to Disney’s Animal Kingdom, and a face painting session in Dinoland, U.S.A.! Sophie wanted to use part of her money to get her face painted, it wasn’t all that expensive, and Sophie enjoyed it all day! Magical Blogorail – Epcot’s Hidden Treasures! Ahh, Epcot! That Crown Jewel that is two parks in one, bridging the gap between the world of tomorrow, and the countries of the world. For today’s topic, we are going to explore the many hidden treasures that you can find throughout Epcot, so let’s get started! There are so many great things to see and do and eat at Epcot that it is nearly impossible to do them all! Some of the hidden treasures that I’m going to describe are things that I’ve never even experienced, while some are things that I only found out about by pure Disney Magic. Epcot is such a great park! There are so many things to see and do, it is really easy to miss something, even something that might be right in front of you. That’s why I’m having so much fun writing this piece. For me, the best hidden secret of Epcot was one that took place in Morocco, hidden way in the back of that small pavilion…one day (June 21, 2008, to be exact, but who’s counting) Cindy, Sophie and I were at Epcot, and ventured into the pavilion at Morocco. We had been here before, but truly, we didn’t ever seem to spend a lot of time here, it just wasn’t all that captivating to us, you know? Anyway, for some reason, the Disney Magic seemed to be leading us all throughout the pavilion, which was great because there are some really cool things to see, when all of a sudden, quite by accident, we came around a corner, and who was there, all by themselves, waiting for guests — Princess Jasmine and the Genie! It was a moment when time stood still — we were the only ones there, and I remember Sophie being able to visit, and hug, get autographs, and talk, just talk, for something that felt like an eternity, but was probably 5 to 10 minutes. It was that long sought after Disney Magic at work, guiding us, drawing us in, so that Sophie could have her time with Princess Jasmine (poor Genie must have felt like the third wheel because Sophie could have cared less that he was there!). It was during this visit that I snapped this picture, one of my all time favorite pictures. Regular readers of our blog have seen this picture so many times that they are probably sick of seeing it, but this picture, with Sophie whispering in Princess Jasmine’s ear, is a memory that I will never forget. Another picture I like out of this set, but one that I don’t show as often, is this one of the Genie, and how hard he is trying to get her to look at him! Truth be told, Sophie was polite, and she did talk with him, but the person that she was really interested in during this encounter was Princess Jasmine. There are so many other wonderful hidden secretes of Epcot. Some of the others that I like are the garden train layout at the Germany pavilion (did you know that the Imagineers decorate the town on the layout when they are having special events at Epcot? ), the special walkway bridge over in Japan (it is like being transported back in time to Ancient Japan), and the hedge maze over in the UK pavilion. But for me, my favorite hidden secret was the time we came upon Princess Jasmine and the Genie.